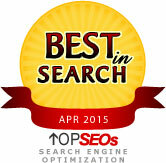 Search engine optimization firms help rank you ahead of competitors on Google. And what good is your awesome website if customers can't find it? FreshPromo is a top-ranked SEO firm that specializes in content optimization, keyword analysis, citation & link building. The company's founder has been successfully managing SEO projects since 2001. Up-to-date, effective and ethical search engine optimization strategies are the staples of our success. So what makes our SEO services the best choice for you? Get Started with our SEO Starter Kit or browse our affordable SEO service plans. FreshPromo is an ethical SEO firm - our optimization methods fall within search engine guidelines and our plans are comprehensive with long-term goals. If you're looking for a sneaky quick fix to cheat Google, we're not the company for you. We offer organic search engine optimization services at affordable costs for businesses of all sizes. Have a look at our SEO plans for details and costs. We also offer local SEO services to rank you in the "Local Pack" Google search results. Our founder, John Metzler, has been managing SEO campaigns since 2001. He has presented at conferences on search engine marketing as well as written articles for leading Internet publications. FreshPromo also has a clean record with the BBB and has clients in Canada, the United States and overseas. The goal of our organic website SEO services is to turn your web site into a significant source of revenue through ethical and affordable organic search engine optimization services. FreshPromo prides itself on honest and direct customer service, and delivering results that will have long-term benefits to the client's overall site visibility. If you are a small business on a tight budget, we can help you reach your goals with economical SEO. For Canadian needs, we offer targeted search engine optimization services in Canada. If you have a Wordpress website and are looking to take it to the next level, we can optimize it to ensure it meets all of Google's guidelines, including passing Page Speed tests and Mobile Responsiveness. Or, let us build you a website using the latest version of Bootstrap - lightweight and fully responsive to desktop, laptop, tablet and mobile browsers. Before hiring a search engine optimization company, site owners should know a few things about their web site and competition. Although FreshPromo offers search engine optimization services, we also offer this detailed analysis, free of charge and with no obligations, to anyone thinking of hiring an SEO firm. Our reviews are done by SEO experts and include suggestions and observations unique to your web site. Each day, millions of people use search engines, such as Google, Yahoo! and Bing, to shop for products and services. By identifying your target market on the major search engines and developing a search engine optimization (SEO) plan to meet your specific needs, FreshPromo will substantially increase the number of Internet users reaching your site who are interested in buying your products. We begin the SEO process by learning about your products or services and customer base. Keyword research is the next and most crucial step. Identifying the phrases that potential customers actually use to find your products is something only a professional should do for your business. From there we develop a plan that revolves around your goals and budget. This ongoing plan will focus on relevant web site content and a link development campaign. Take a more in depth look at what is included in our search engine optimization services. SEO companies start up (and fold) all the time, which makes it even more important to go with a team that has been in the Internet Marketing industry for years; an SEO firm that has seen the important algorithm changes month in and month out; and a company that, by documenting the past, actively participating in current debate, and always adhering to ethical methods, does not rely on guesswork but proven optimization methods instead. We hope to be your SEO partner for years to come and look forward to the opportunity to help your business grow. The founder of FreshPromo, John Metzler, keeps an SEO blog offering commentary and stories about the search industry - follow along and gain some valuable free tips! FreshPromo's exceptional services are the result of our expert knowledge of the industry. Having us work with your company to achieve its online goals makes a lot of sense. However, we realize that there are some small business owners or managers who wish to educate themselves on the topic of search engine optimization instead of hiring an SEO firm. For this, we provide an ever-growing resources section devoted to Internet Marketing. Visit the FreshPromo SEO Knowledge Center. How to implement a 301 permanent redirect?